From ancient Chinese Great Wall to Maginot Line, both in Western world and Eastern world, many great walls have been built in the history. 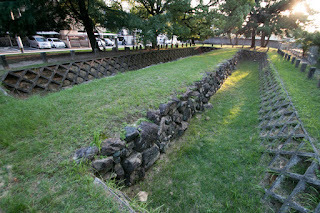 But in Japan, no such great wall was built prior to World War 2. 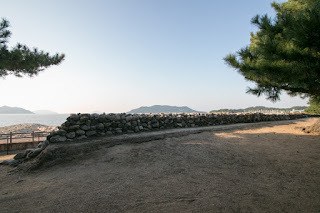 Of course the most critical reason is the fact that because of the geographical condition surrounded by sea, there had been scarcely no direct confrontation against different faces which brings serious tension at the border. Besides, genuine cavalry corps needs hard obstruction to stop also did not emerge in the history. 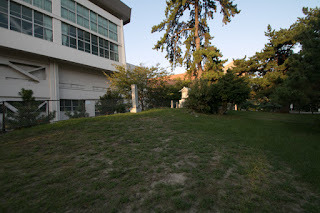 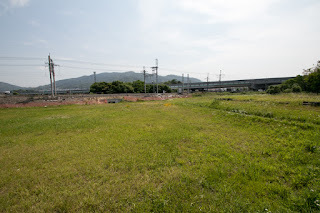 Furthermore, genuine flat place is quite limited in mountainous mainland, and it was possible to build defense line utilizing existing hills, without building concrete walls. 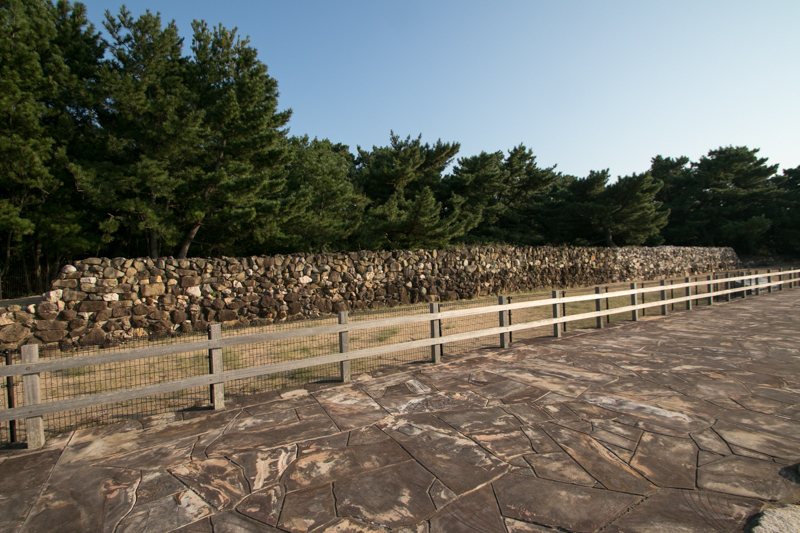 Additionally, bricks which are ideal to build concrete wall did not spread as construction materials in Japan because of its humid climate. 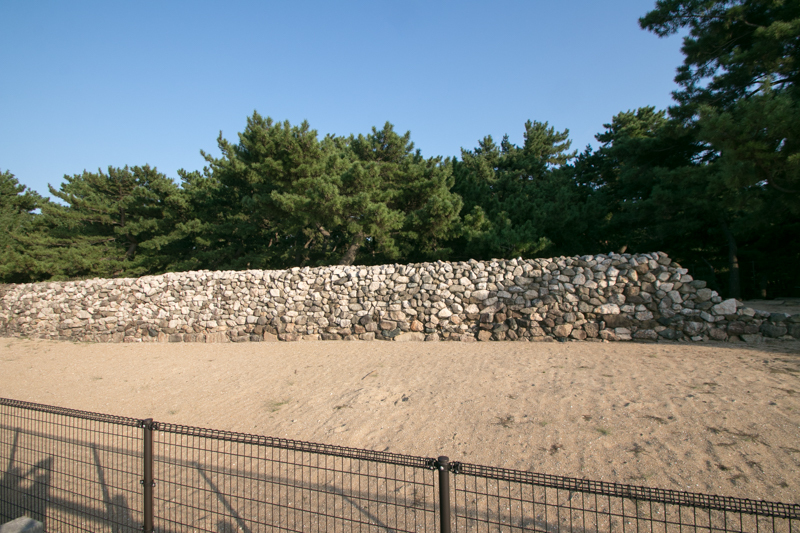 However, if necessary, many large walls were built even though they were not great. Most of them were built to protect or siege particular place such as cities or castles. 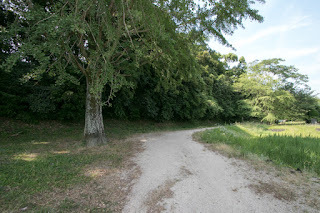 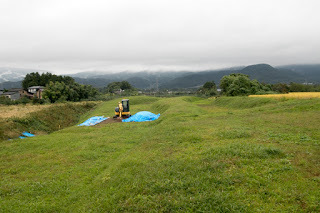 But there were three walls which were built at flat place just to stop the enemy troops. They were Mizuki fort built in 7th century, Atsukashi-yama fort used in 12th century and Genko Bourui fort constructed in 13th century. 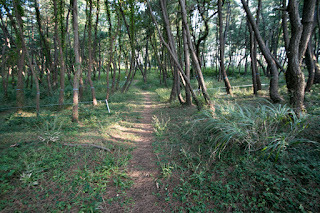 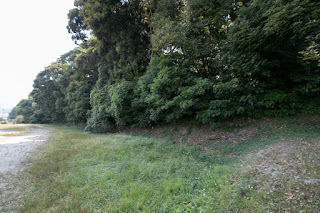 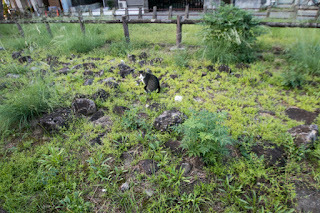 Mizuki Fort (水城) is a long line of clay wall prolonged over 2 kilometer at the north of the ruins of Dazaifu city, at the border of Onojo city and Dazaifu city in the south part of Fukuoka plain, Fukuoka plain is formed by several short rivers flow from Sangun mountains and Seburi mountains, and Mizuki fort exist at the narrow corridor between both mountains where Mikasa-gawa river flows. 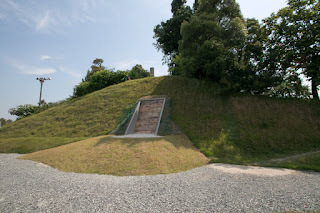 Mizuki fort was built to protect Dazaifu city, the vice capital of ancient Yamato Dynasty from the invasion of foreign army. 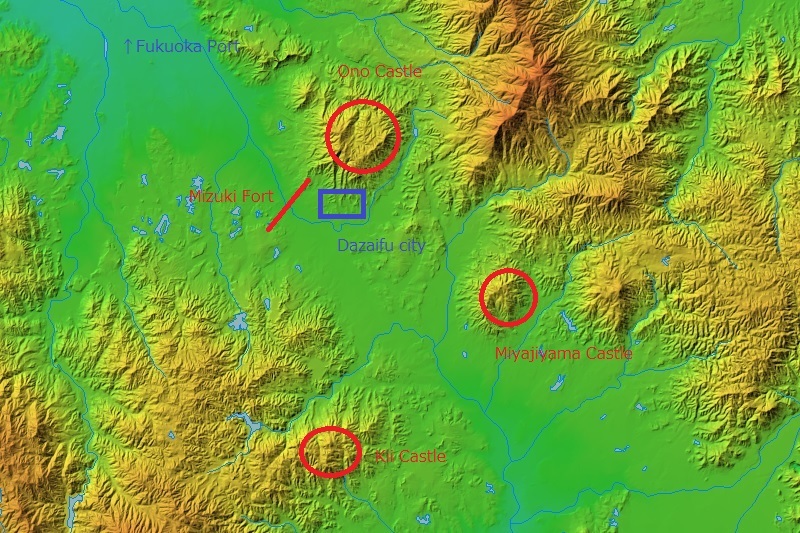 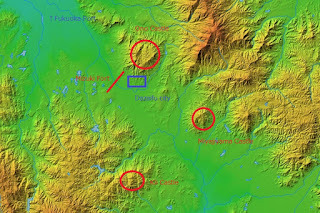 In ancient Japan, several capitals such as Asuka-kyo city or Fjiwara-kyo city were built just at the flat place and only protected by rivers. 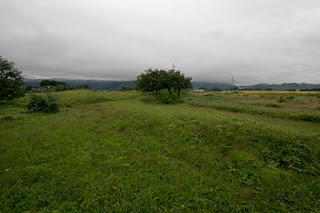 But vice capitals at marginal areas were built at securer place, considering the possibility of military conflict. Especially in Kyushu region, Yamato Dynasty sent large army to the peninsula to restore ruined Baekje Kingdom but suffered severe defeat before the alliance of Chinese Tang Dynasty and Korean Silla Kingdom in 663. 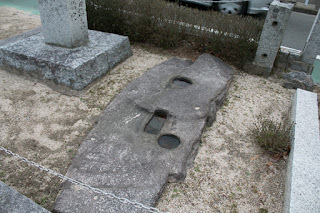 Yamato Dynasty lost many soldiers and had to prepare for the invasion from the peninsula. 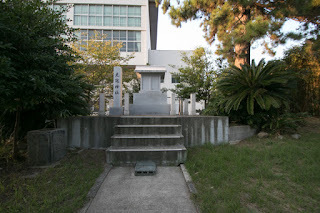 Historically the local office of Yamato Dynasty had placed around Hakata area to manage the diplomacy and foreign trade. 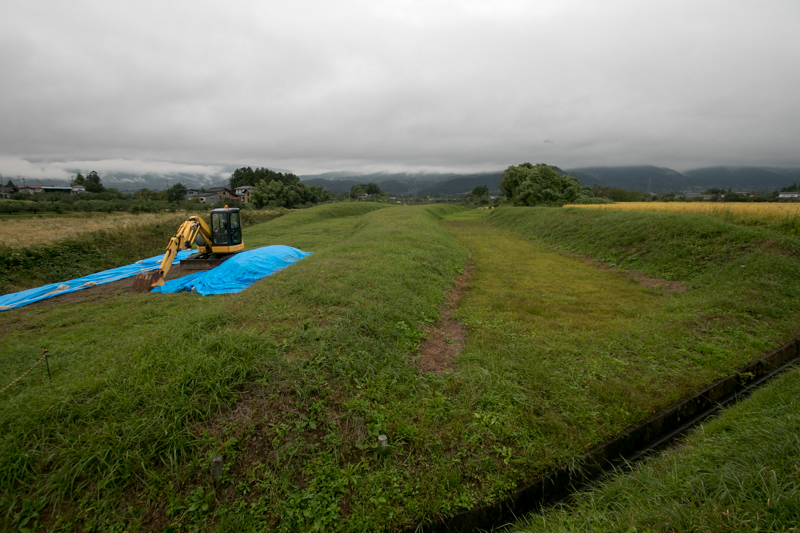 However, under above situation, it was necessary to hold and command the army in case of emergency at this area, in addition to the management of foreign trade and communication. 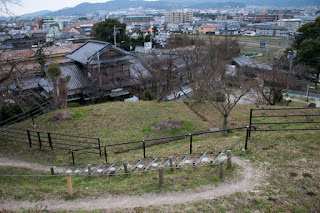 Yamato Dynasty built Dazaifu city at the side of Oshiro-yama mountain in the valley of Mikasa-gawa river, and surrounded it by mountain castles such as Onojo castle or Kii castle and clay walls which shut the north and south end of the corridor. 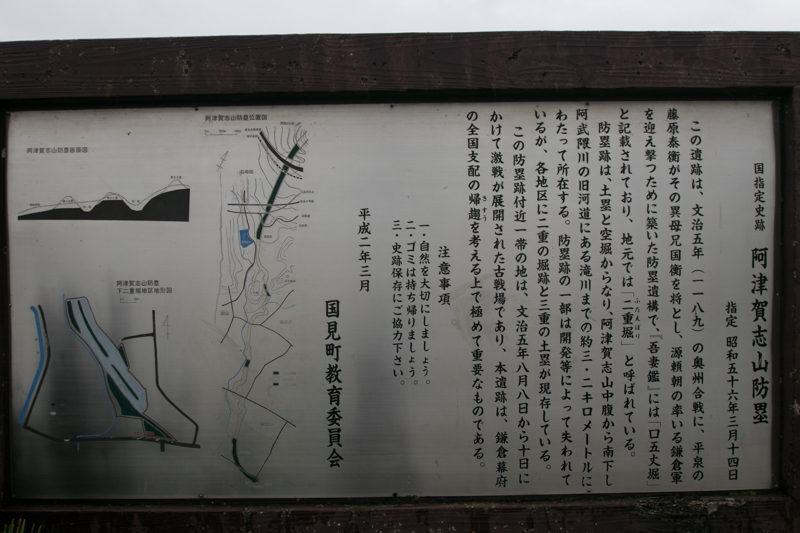 Mizuki fort was the north barrier of the valley which prolongs from the edge of Oshiro-yama mountain to the opposite shore of the river. 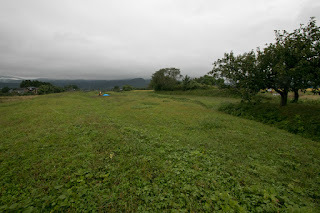 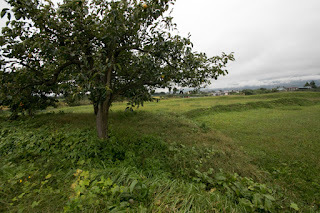 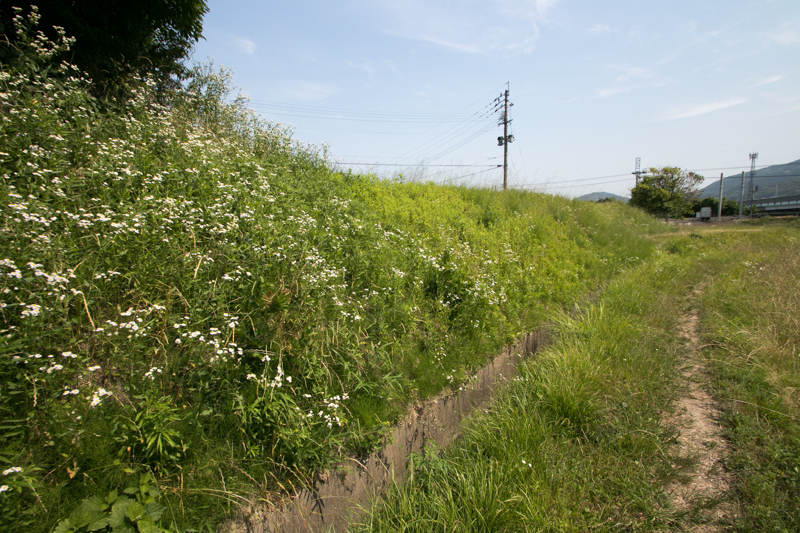 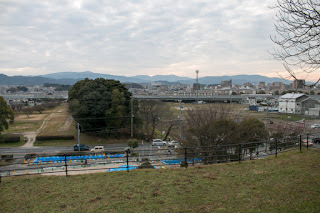 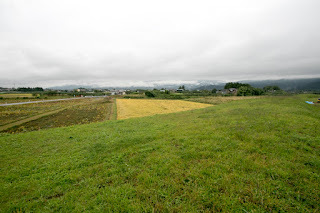 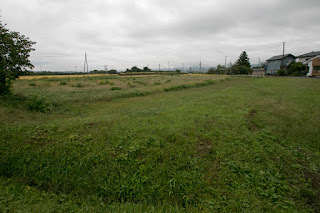 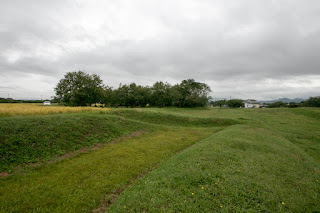 Mizuki fort was huge wall larger than any wall built in the history of Japan. It consisted of main wall which is about 15 meter height at the peak and 80 meter of section length, accompanied with 60 meter wide water moat at front side and small water moat at backside. 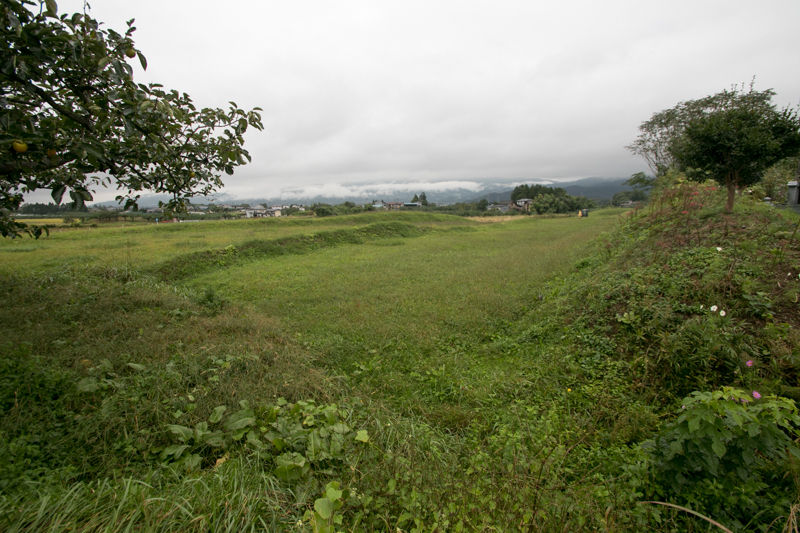 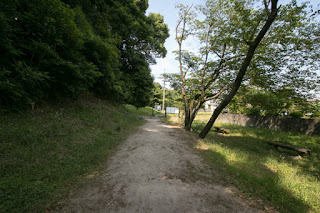 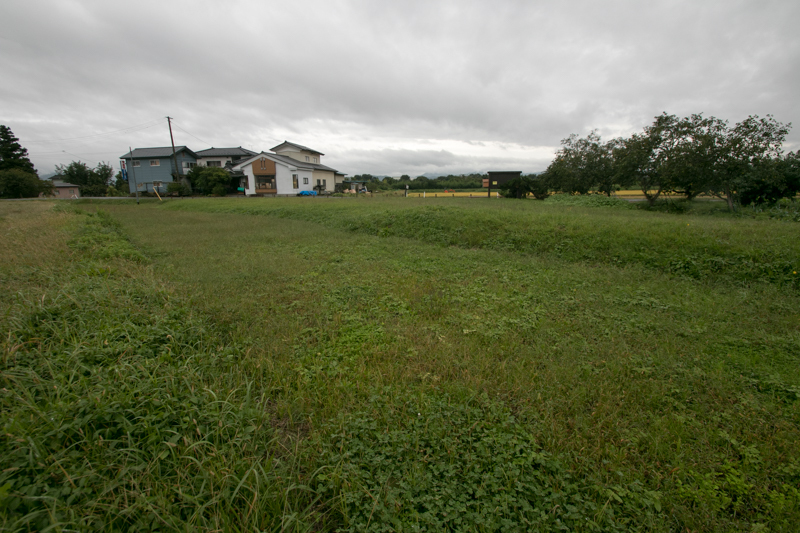 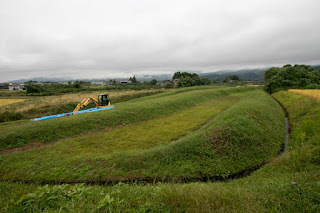 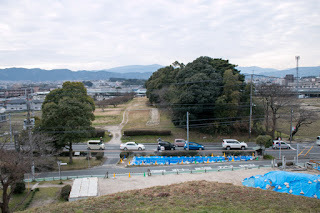 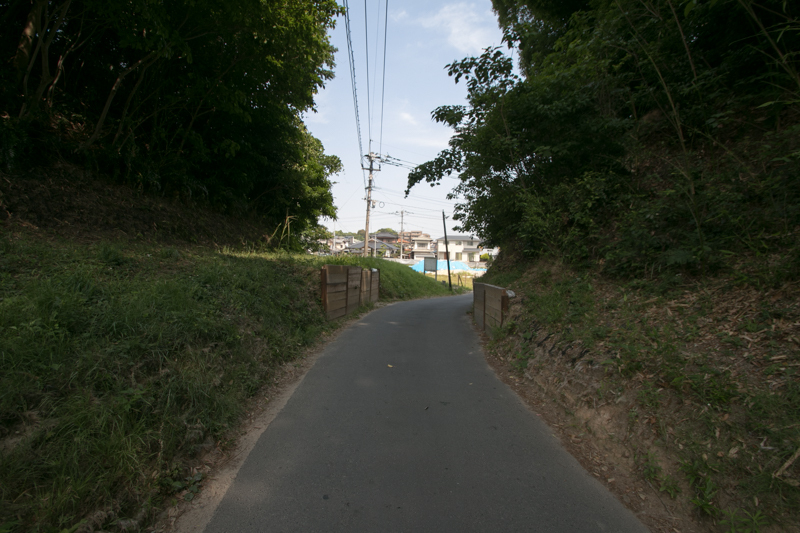 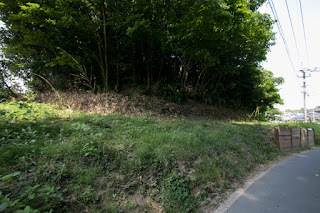 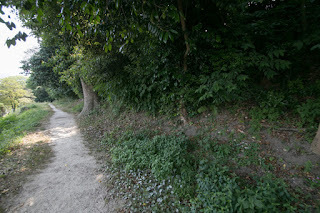 As it was impossible to built a wall over Mikasa-gawa river, huge water moat filled by the water of the river was built to prevent approach of the enemy to the gap of clay wall at the river. Furthermore, huge water moat might be a good obstacle to the cavalry of peninsula and continent. There were two gate at the both edge of the wall, which might have secure gates. 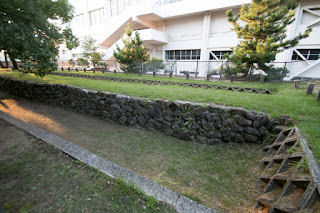 As this wall is too huge, main body of the wall still remain even though it became lower from original. Huge moats disappeared but slightly remains as a lower flat area in front of the wall. 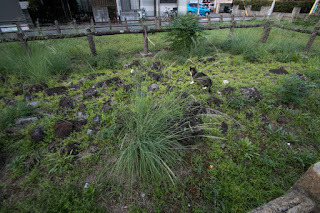 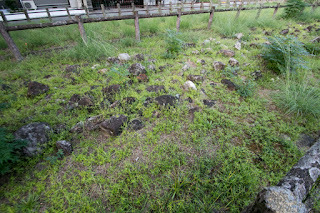 Ruins of eastern edge such as the starting point from Oshiro-yama mountain, corner stone of the gate and clay wall itself, is best preserved. 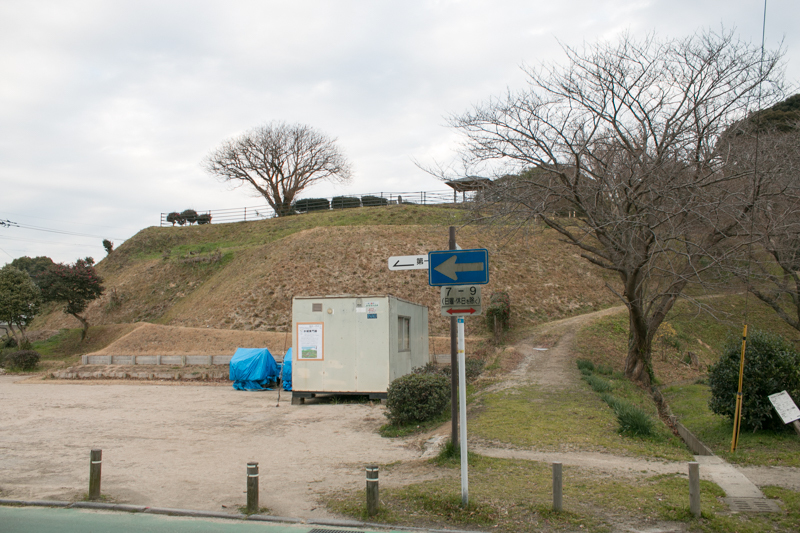 Fortunately at this time there was no invasion to Dazaifu city and Mizuki fort was not used. However, after 500 years from the construction of Mizuki fort, medieval Japan had to face actual invasion from the peninsula and continent. 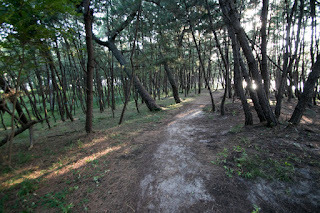 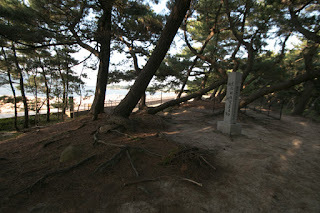 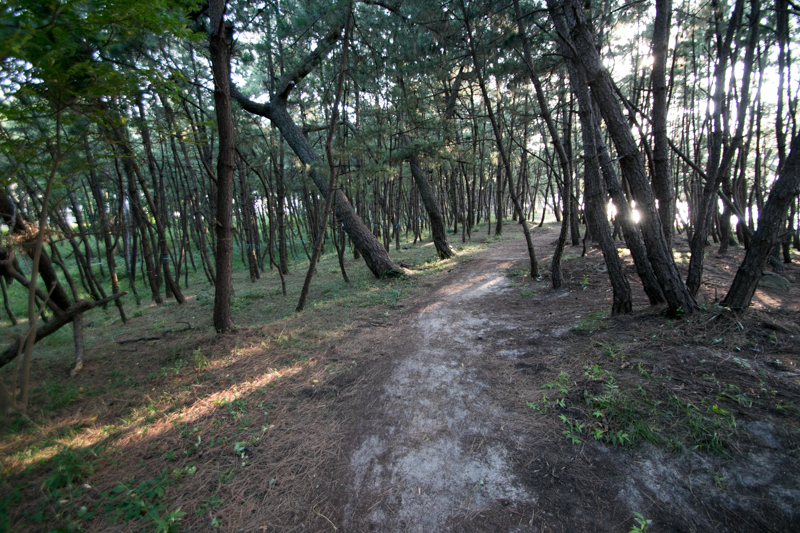 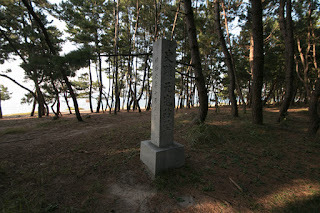 This was two time attack of Chinese Yuan Dynasty and Korean Koryo Kingdom to Kyushu island. 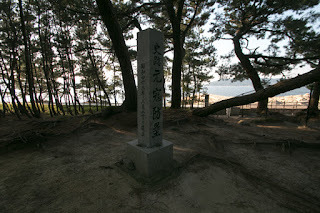 At the first invasion in 1274, this army slaughtered the people of Tsushima island and Iki island, then landed to the coast of current Fukuoka city. 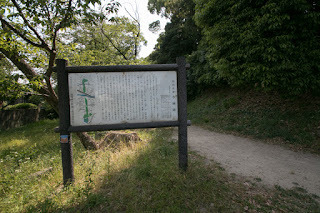 Kamakura Shogunate ordered local samurais to intercept the enemy, and before the brave fight of these samurais the enemy army once returned to their ships. Just at that time the enemy army suffered severe damage by the bad weather, and their first attempt failed. 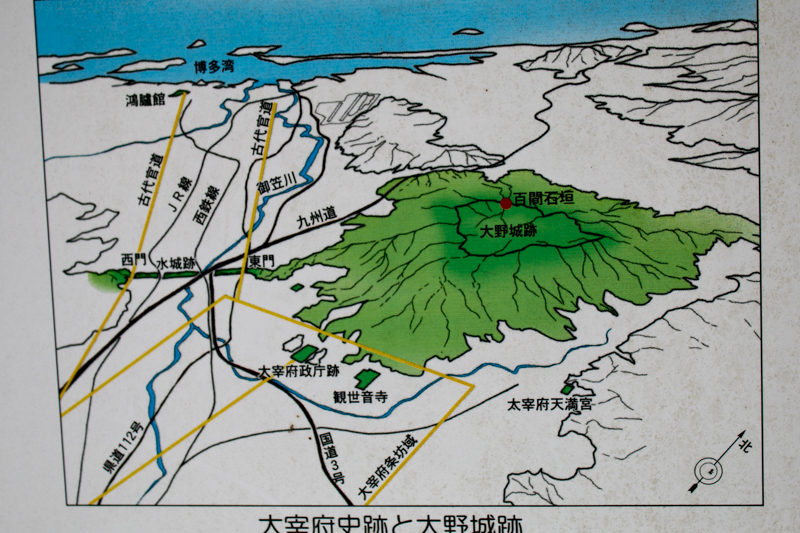 However, Yuan Dynasty did not change their will of invasion, and another attack was surely expected. 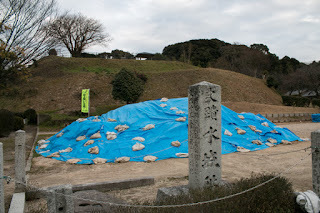 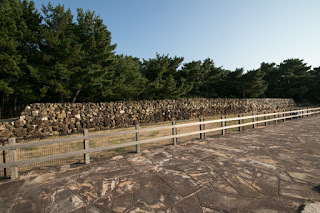 Prepare for the next campaign, Kamakura Shogunate ordered their retainers of Kyushu island to build clay walls along the coast called as "Genko Bourui" (Yuan wall). 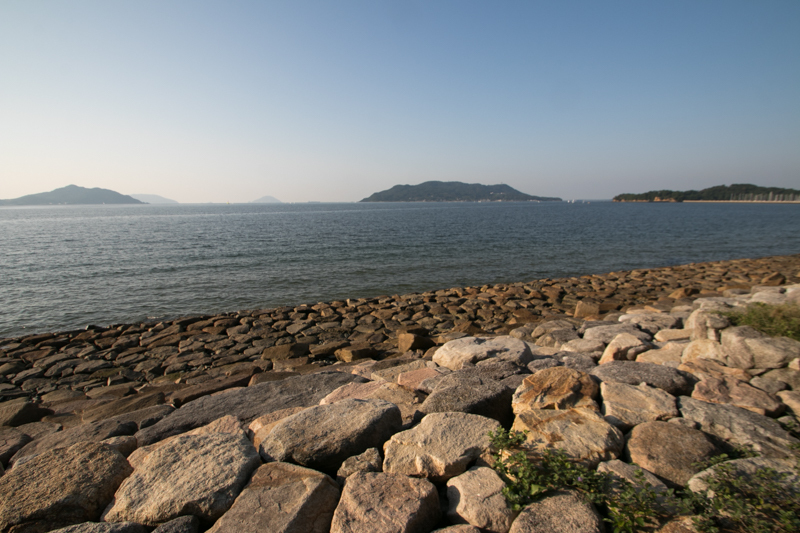 This wall prolongs over 20 kilometer long the coast of Hakata bay. 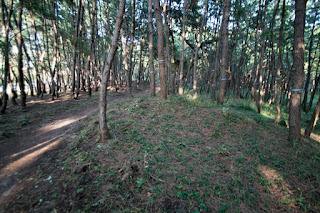 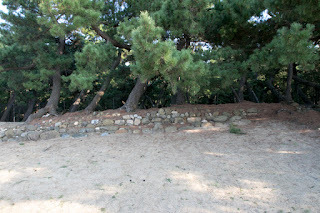 The wall is built utilizing the height gap of sand beach and backside land, and its height was about 2 meter at the top. 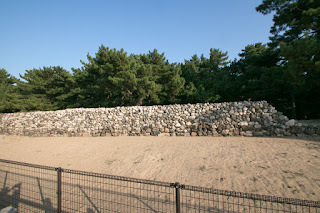 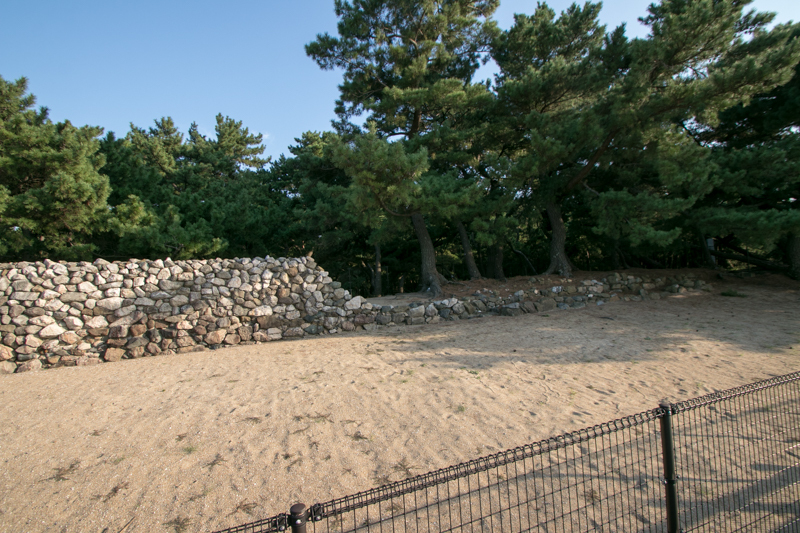 Seaside of the wall is a vertical one protected by stone wall, to prevent the climbing of the enemy. 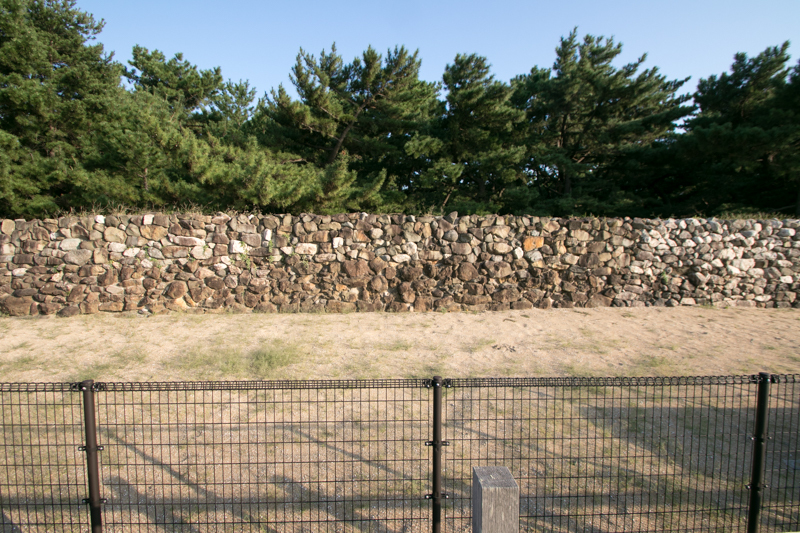 On the other hand, land side of the wall is gentle slope where Japanese cavalry could ride up to the top of the wall and shoot the enemy. 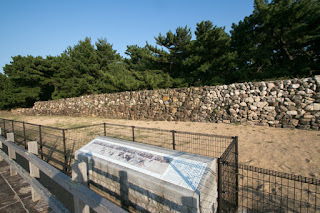 As expected, Yuan Dynasty and Koryo Kingdom made second invasion to Japan in 1281. This time the enemy sent far larger convoy to Japan compared with first attempt, but this time Japanese samurais build a secure defense line utilizing this wall. 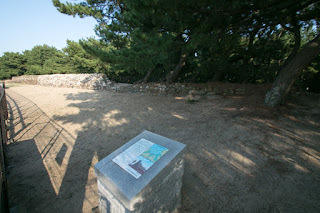 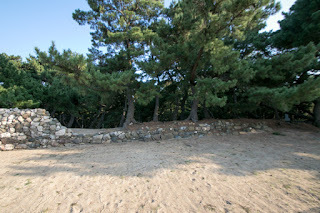 Especially Michiari Kono (1250-1311), the local lord of Iyo province (Ehime prefecture), stayed in front of the wall to show his will, and was praised as "Ushiro Tsuiji no Kono "Kono at front of wall". 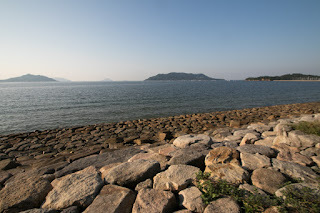 Looking at the wall, enemy army gave up the landing to the Hakata area and retreated to Shikano-shima island, a small island connected to the land by small sandbank. 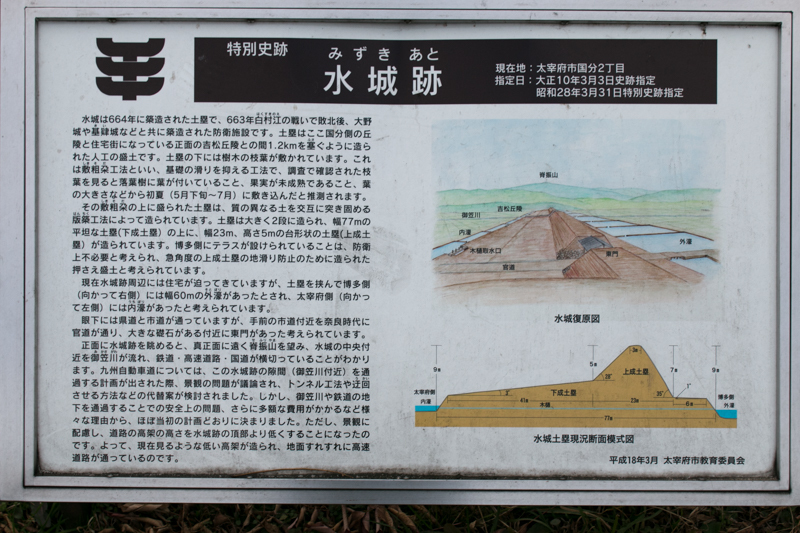 But at this narrow point the enemy army could not show its mobility, and before the attack in waves of Japanese army, this vanguard suffered severe defeat and retreated to Hirado area, to join the main force. 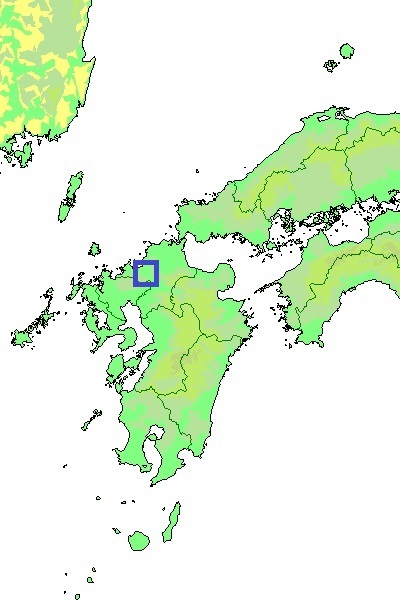 Yuan army and Koryo army met off the coast of Hiroshima island near Imari city. But before the assault of Japanese navy such as Matsura clan, enemy army gradually suffered damages. 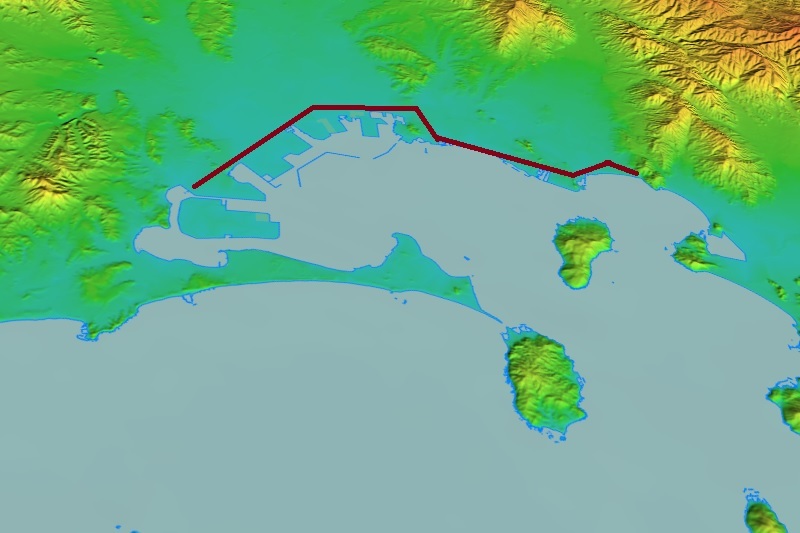 Additionally, a typhoon hit the mooring convoys. 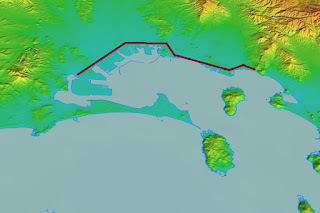 Many enemy ships sunk in the sea, and remaining convoys gave up their operation and returned. 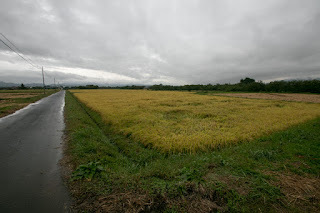 The fact that strong enemy army was destroyed two times by the storm brought a belief that Japan was protected by the god. 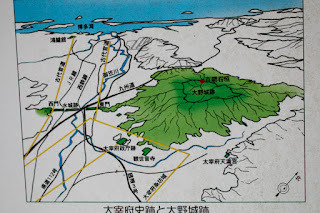 But if the enemy army landed, their army might survive the storm and might bring disastrous damage to the area considering their slaughter at the forefront island. 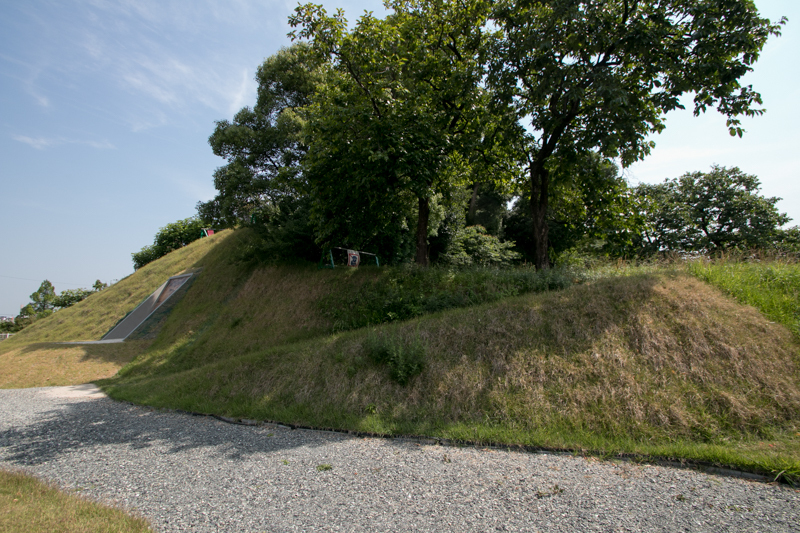 For that mean, sufficient preparation of the wall brought the limitation of the damage and chance of the destruction of enemy army. 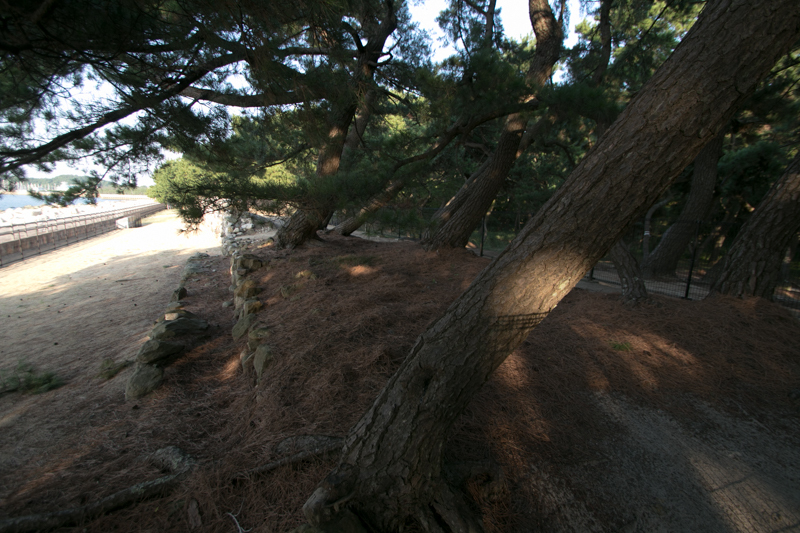 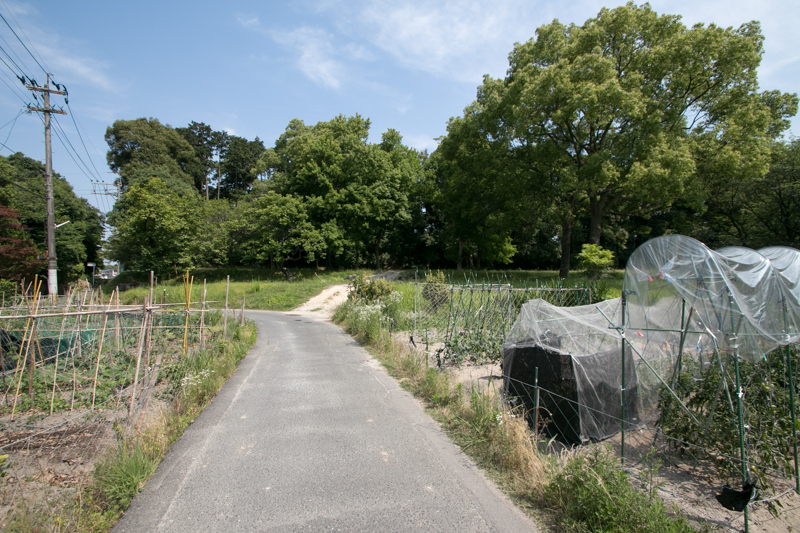 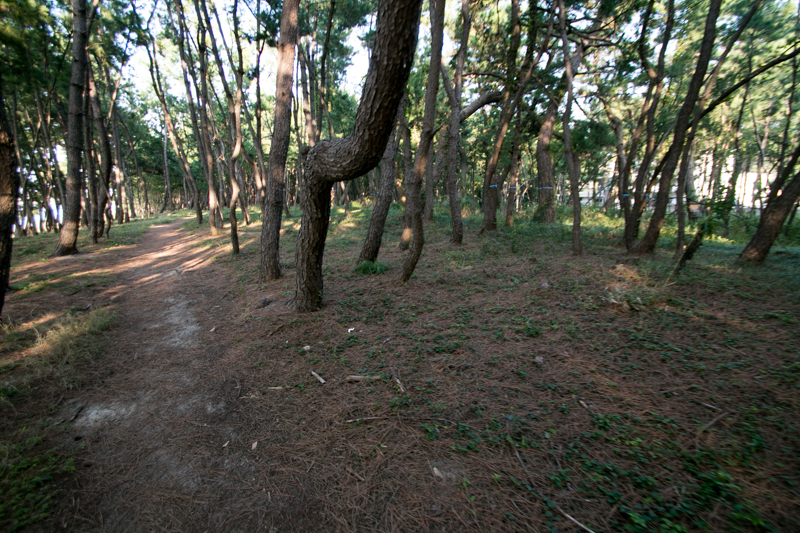 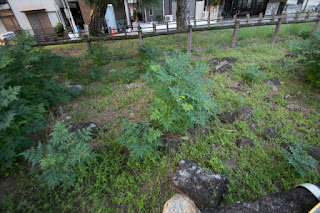 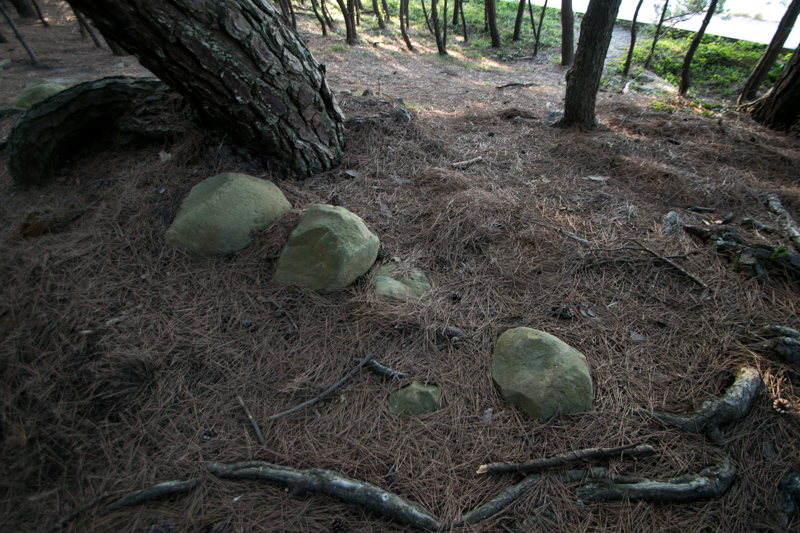 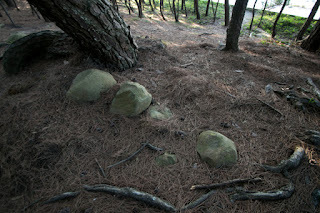 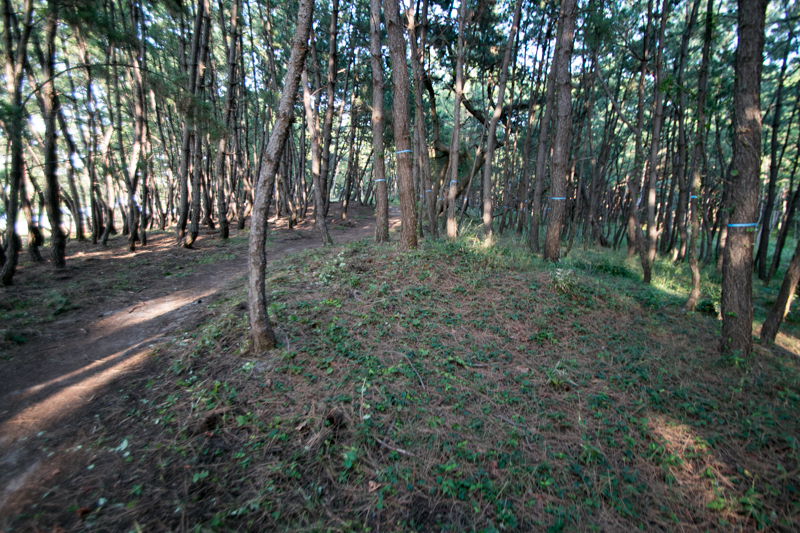 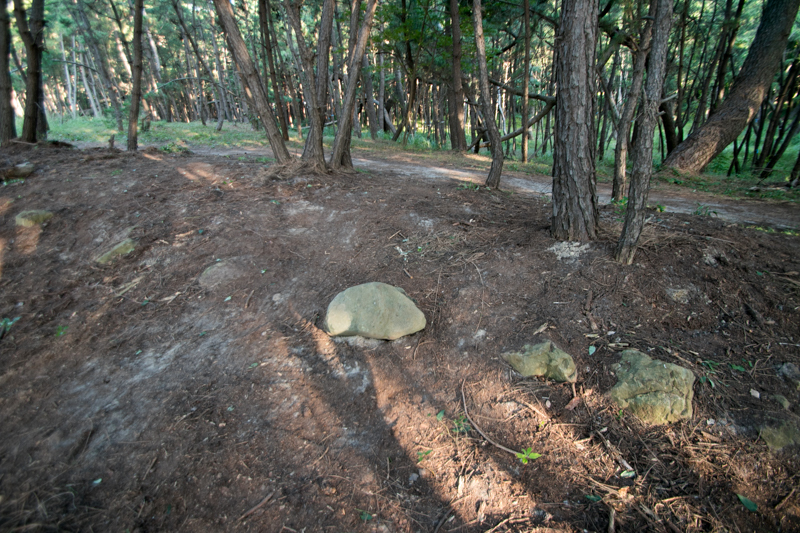 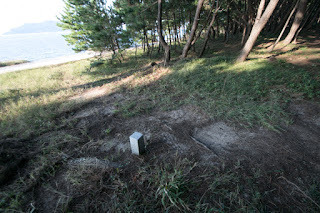 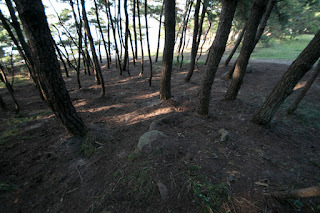 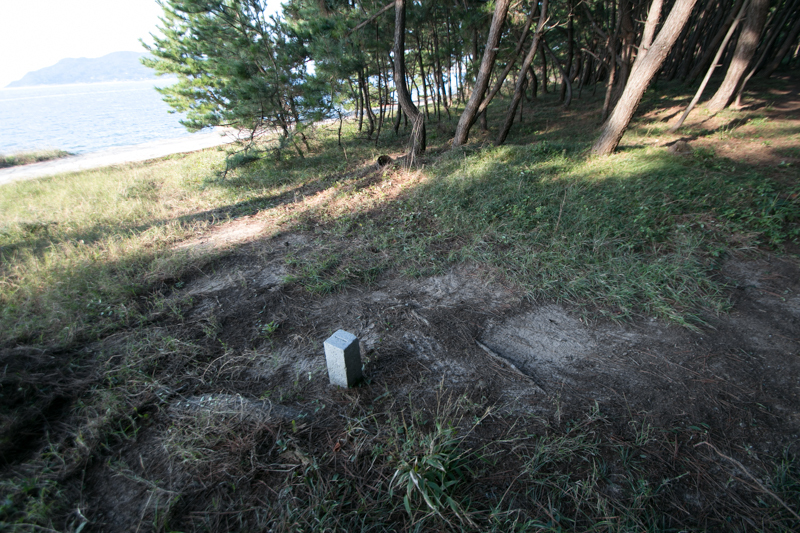 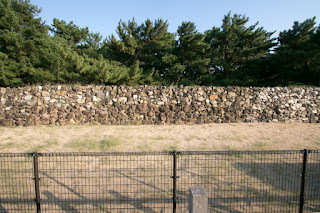 Contrary to Kyushu island, walls of Tohoku region were built for the purpose of internal conflict. 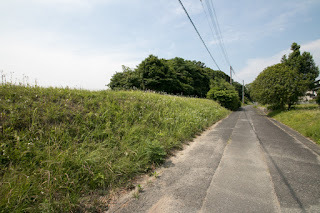 There were several walls at different period but interestingly they were built to prevent the intrusion of the authority of Kanto region into Tohoku region, the territory of semi-independent powers, and sometimes built at same place. 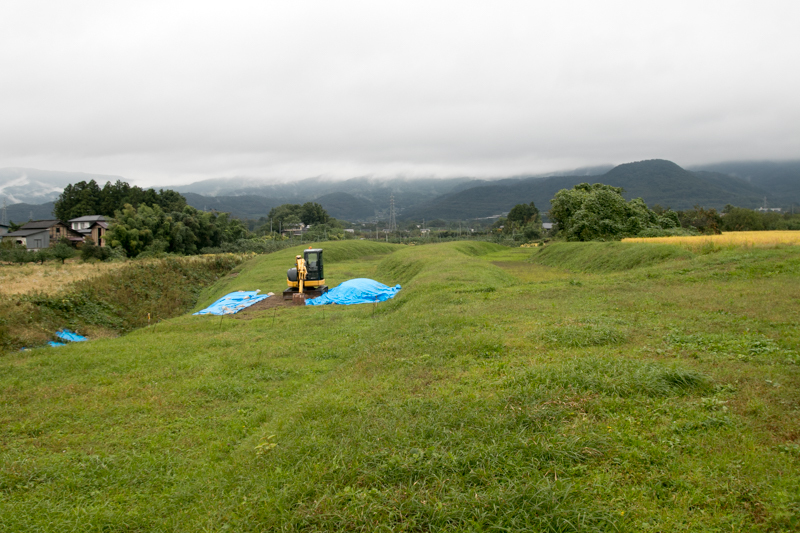 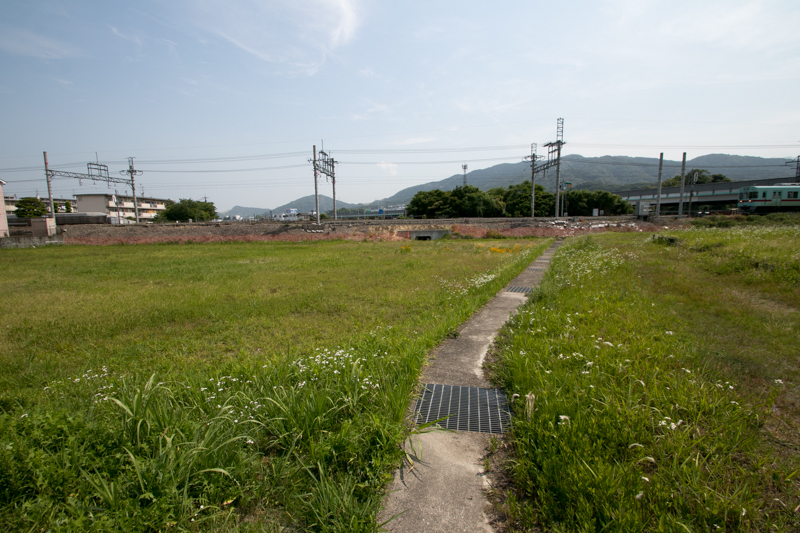 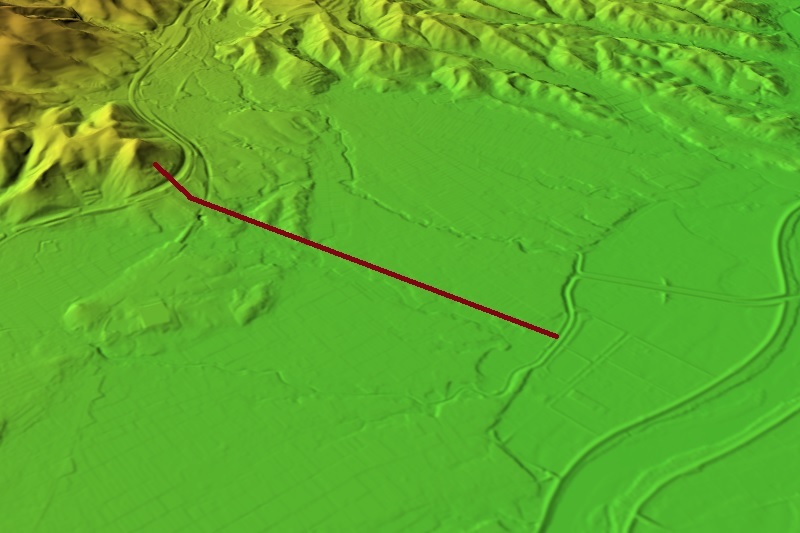 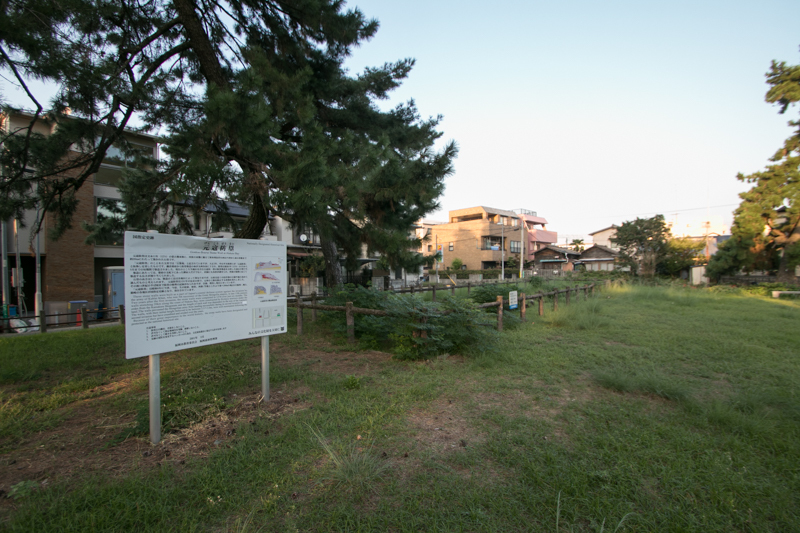 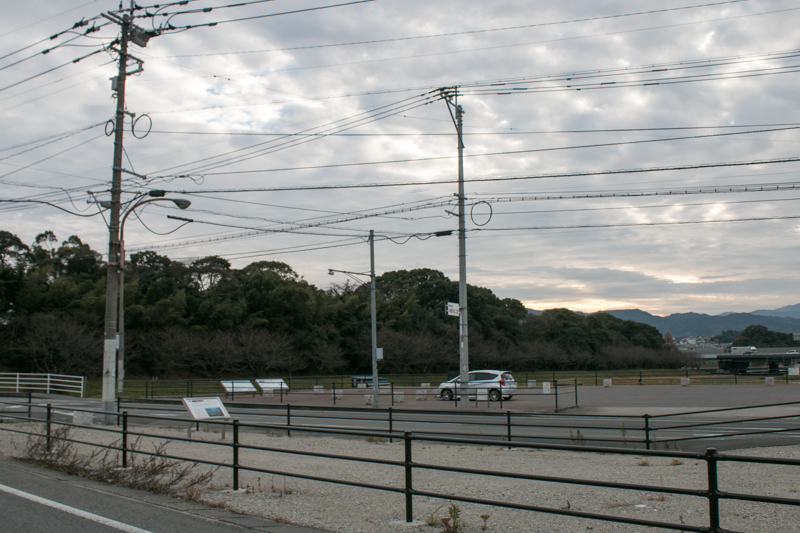 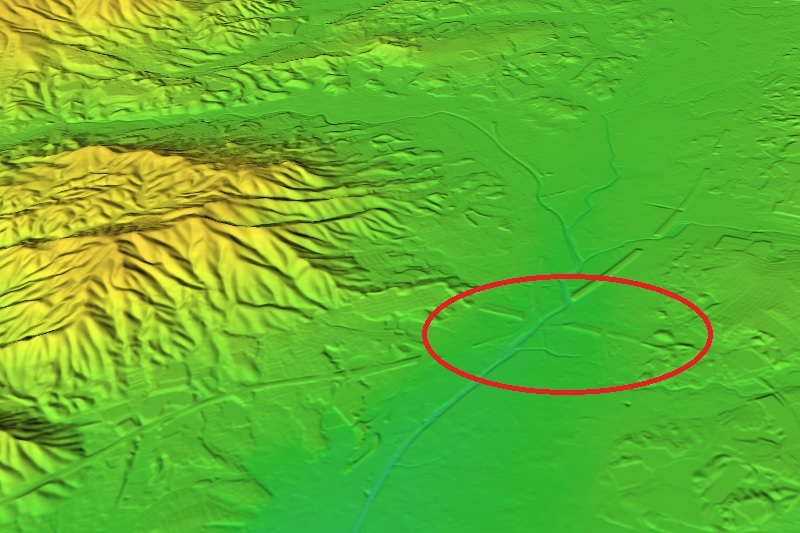 Among these walls, the largest one was Atsukashi-yama Bourui locates at the north edge of current Fukushima basin. 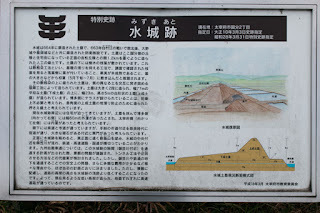 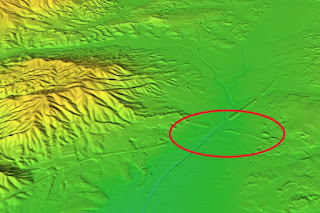 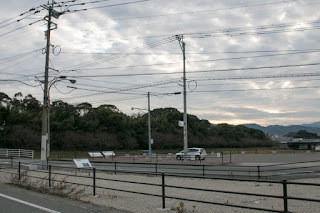 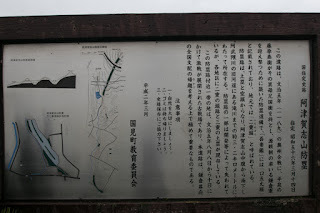 At this point Abukuma-gawa river which forms Fukushima basin flows into Abukuma mountains, and Tozando Road, an ancient major road runs across Kunimi-toge pass and proceeds into Sendai area passing Shiroishi basin. Even now, trains, highways and major roads passing through the ruin of the wall. 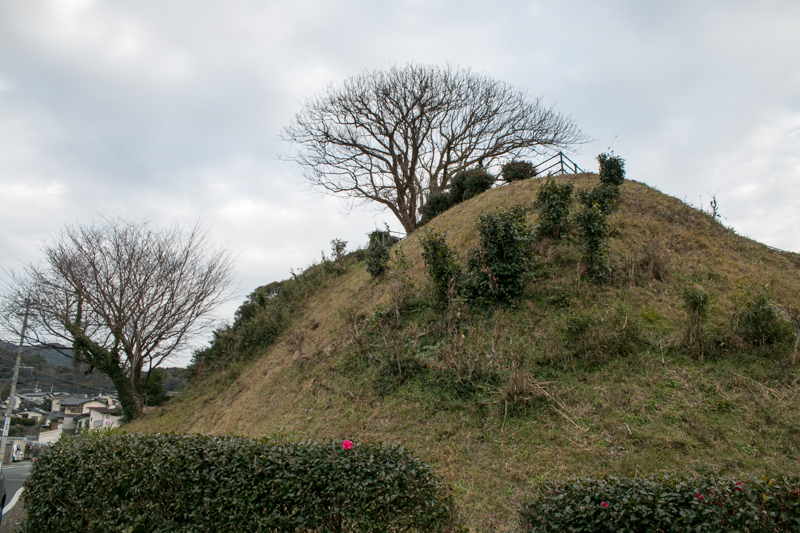 Atsukashi-yama fort (阿津賀志山防塁) was built by Oshu-Fujiwara clan in 1589, to prevent the invasion of Kamakura Shogunate army. 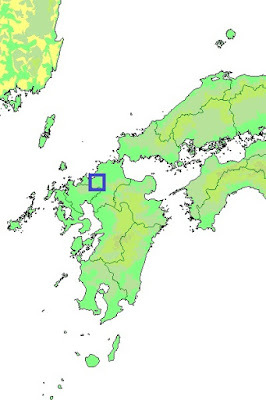 Oshu-Fujiwara clan was a distant tributary of central noble Fujiwara clan but moved to Tohoku region. 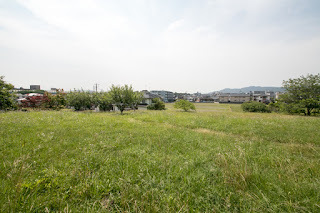 In the latter half of 11th century, Abe clan and Fujiwara clan which were strong local lords of the region were ruined by Minamoto clan by two campaigns, and Oshu Fujiwara clan became the substantial ruler of Tohoku region. Oshu-Fujiwara clan prospered by the production of gold and good horses, and foreign trades around Sea of Japan in the former half of 11th century. 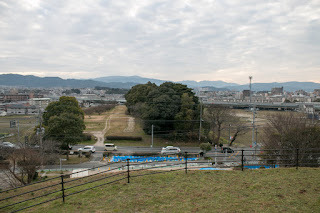 As Oshu-Fujiwara clan nominally followed to the central government of Taira clan which was interested in the trades at western Japan, they can keep a half-independent power. 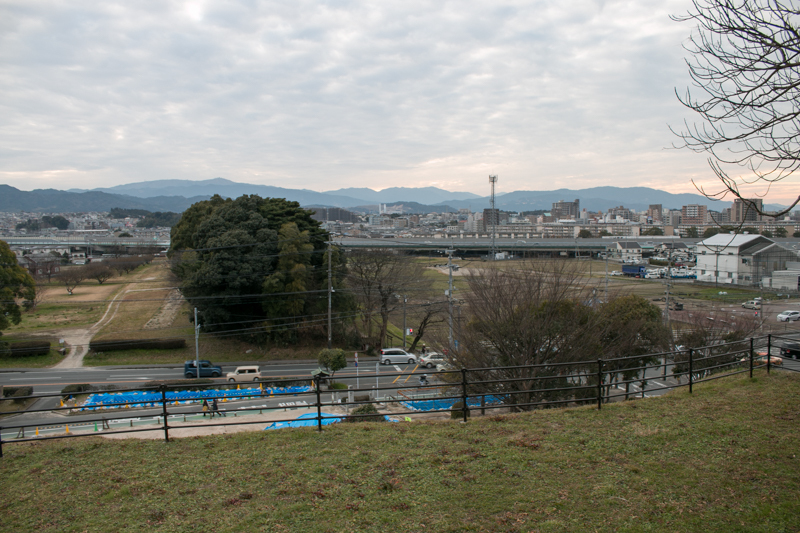 Hiraizumi city which was the capital of the clan prospered with many gorgeous buildings. However, in 1189, Yoritomo Minamoto (1147-1199), the founder of Kamakura Shogunate, ruined Taira clan and next aimed at the territory of Oshu Fujiwara clan. Different from the government of Taira clan, Kamakura Shogunate relies of the feudal relationship with their retainer through territory, and hoped to capture the whole territory of Japan. 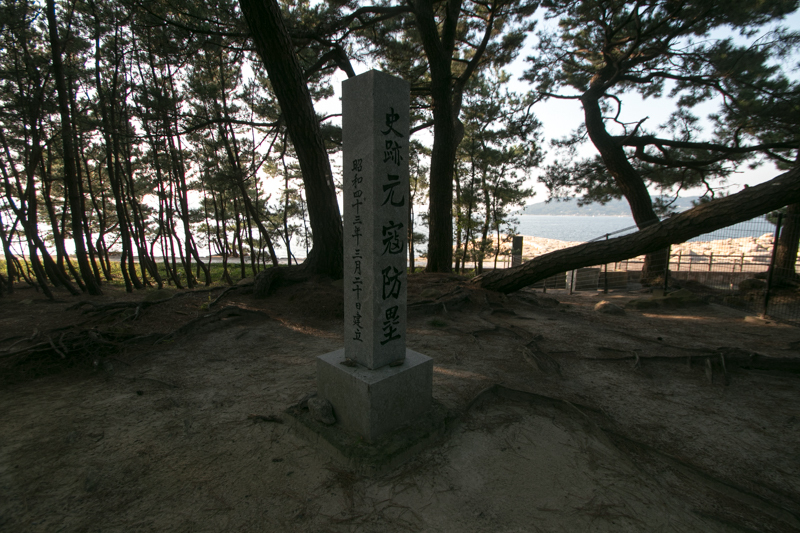 Just at this time Oshu-Fujiwara clan lost their power by severe internal conflict. 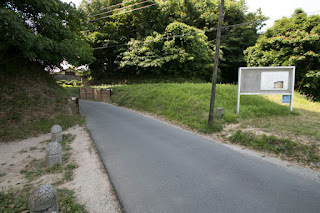 In response to this situation, Oshu-Fujiwara clan accepted Yoshitune Minamoto (1159-1189), the younger brother of Yoritomo who grew up at Oshu Fujiwara clan and broke Taira clan by its brilliant tactics but broke with Yoritomo and exiled to Tohoku region. 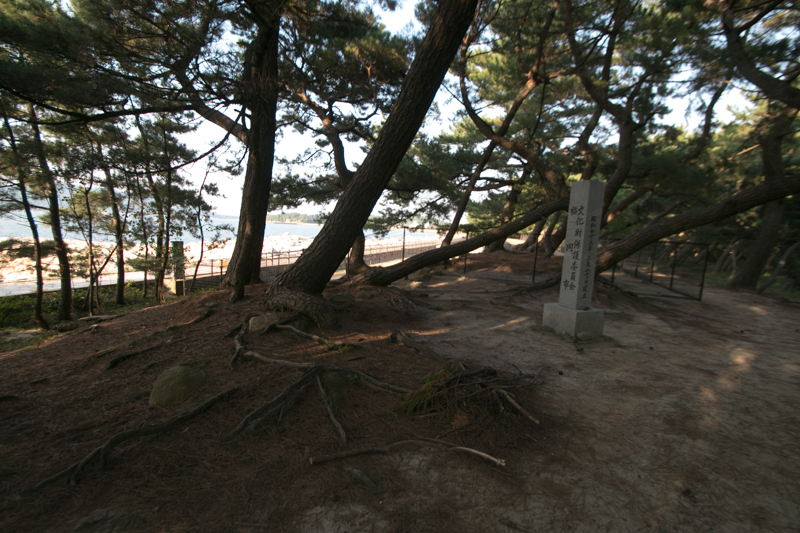 Yoritomo made pressure to Oshu Fujiwara clan to hand over Yoshitune, and cornered leader of the clan finally attacked and ruined Yoshitune at the battle of Koromogawa in 1589. 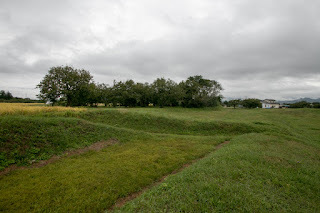 However, Yoritomo sent large army to subjugate Oshu Fujiwara clan by reason of killing Yoshitune. To intercept Kamakura Shogunate army, Oshu-Fujiwara clan built Atsukashi-yama fort at that year. 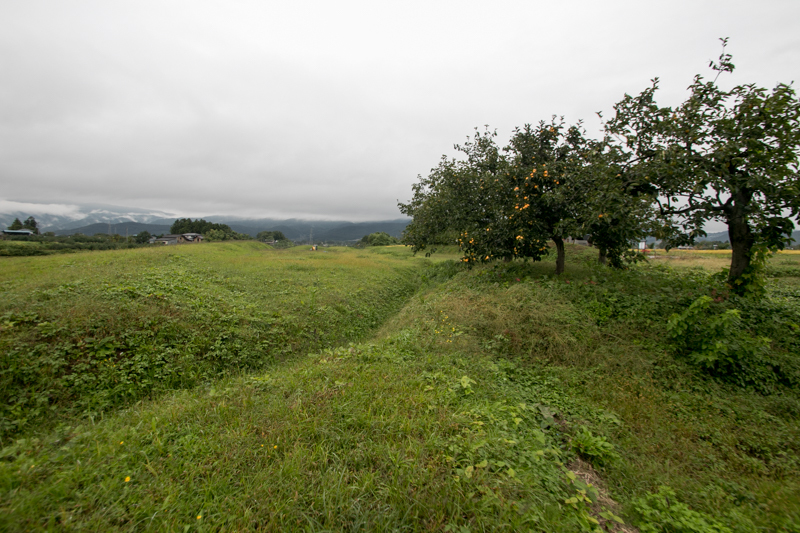 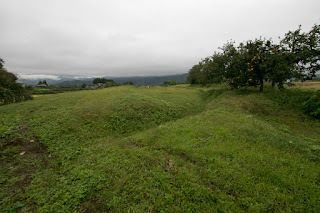 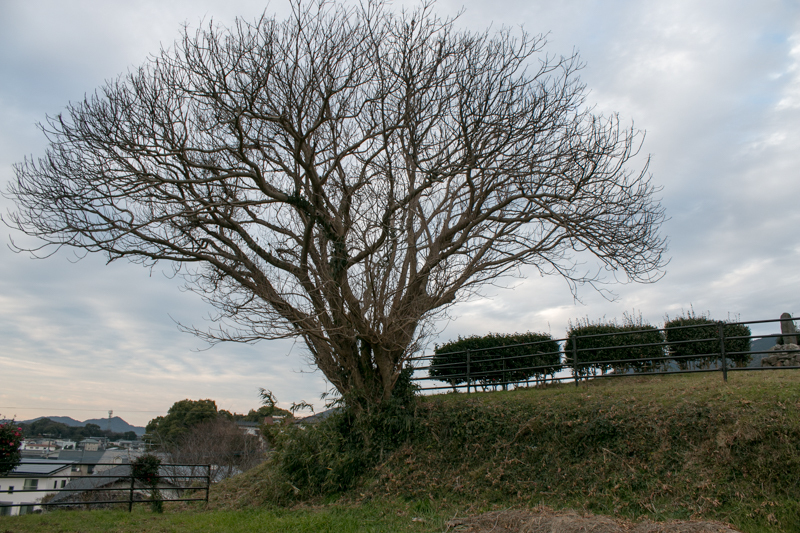 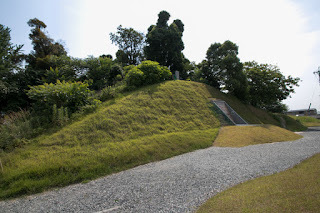 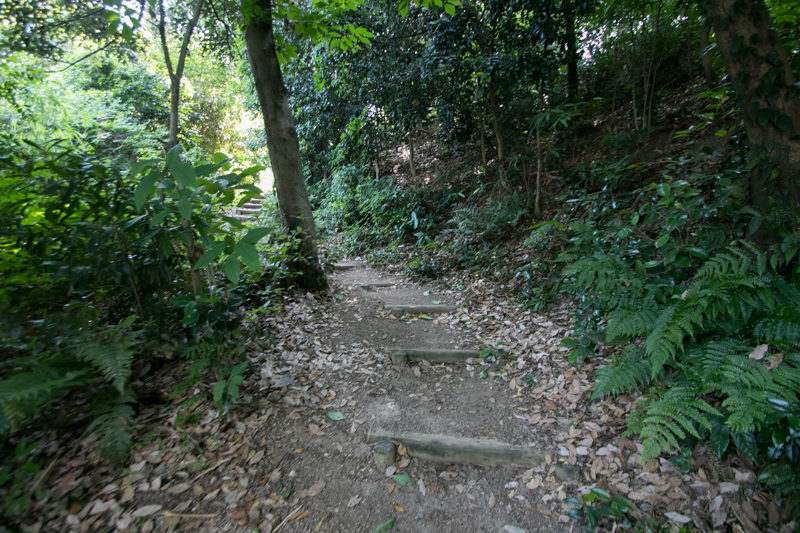 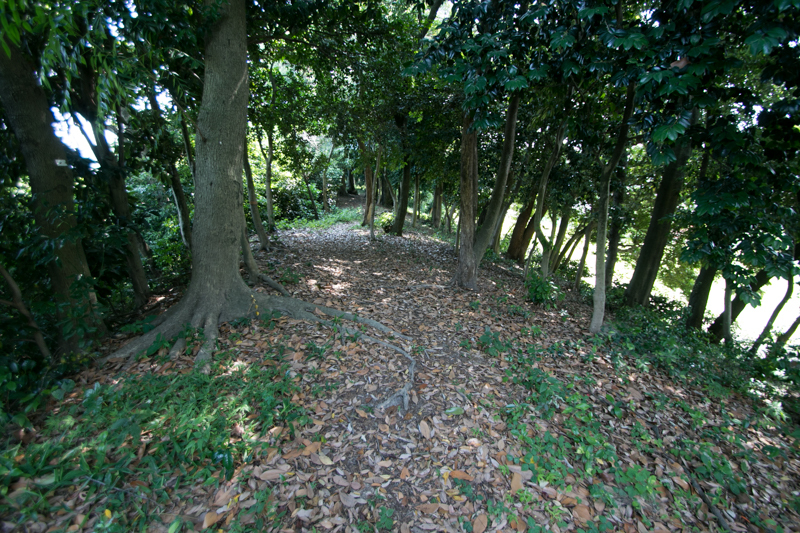 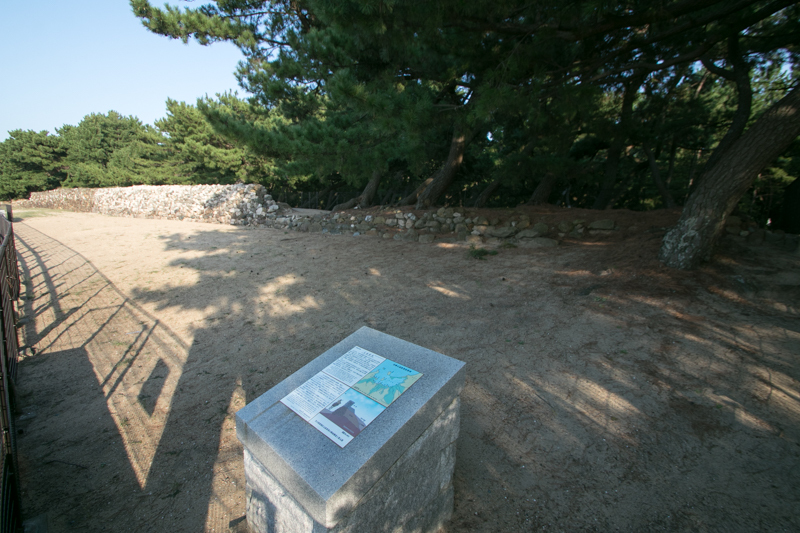 This fort starts from Atsukashi-yama mountain at the western edge of the line and prolongs over 3 kilometer toward south to Abukuma-gawa river. 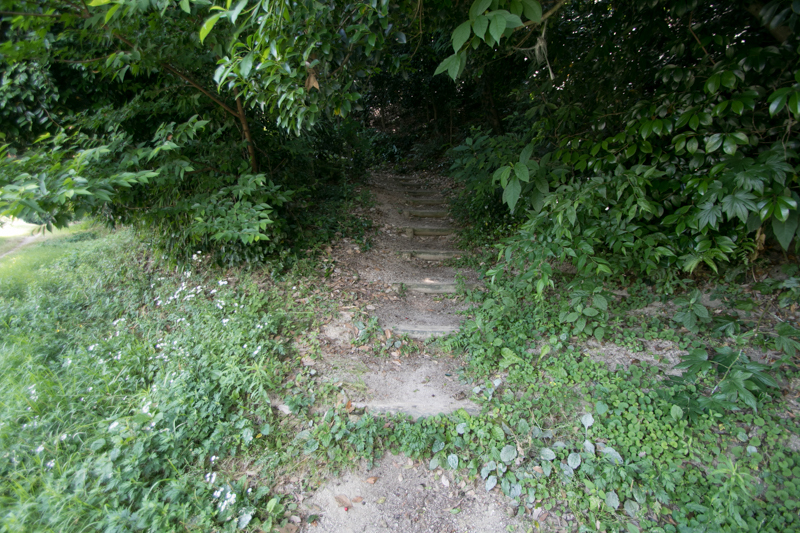 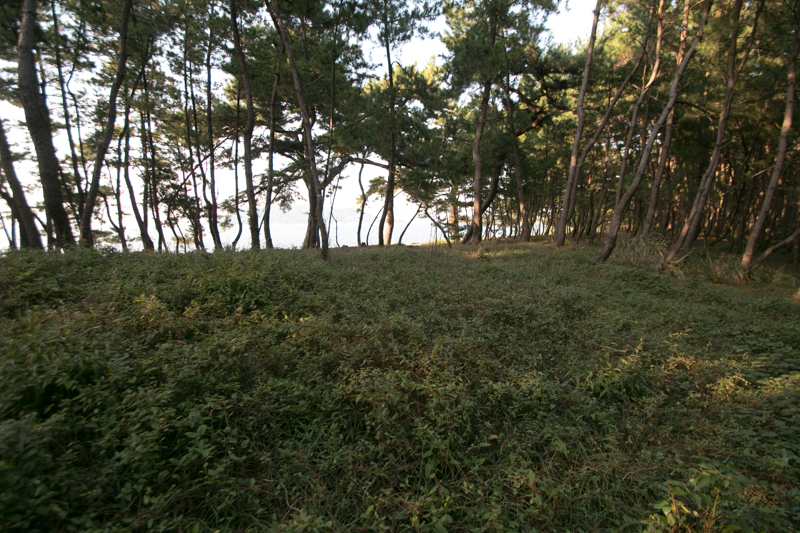 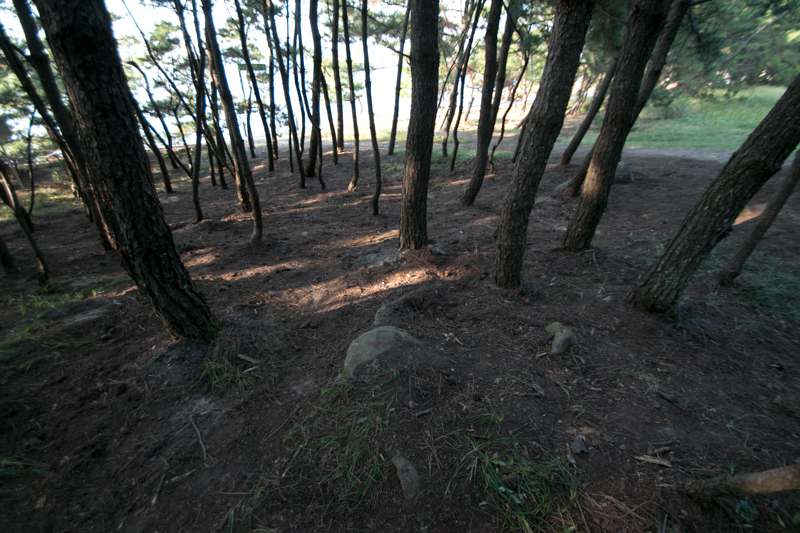 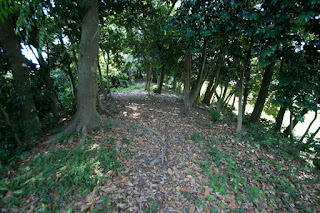 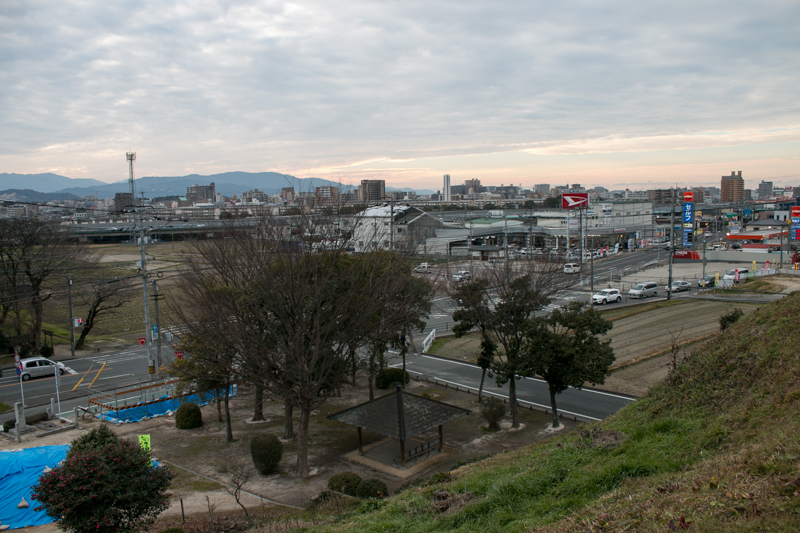 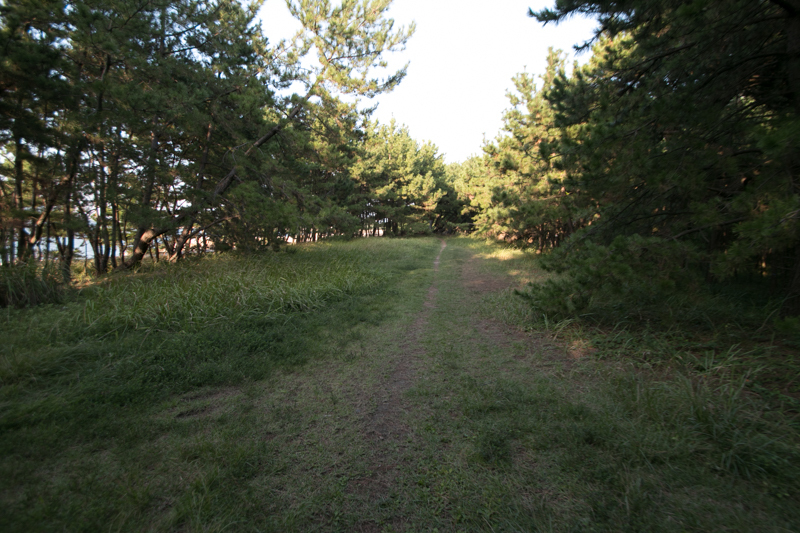 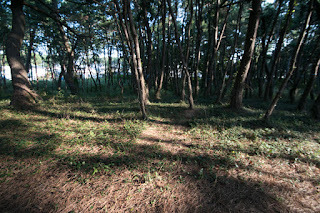 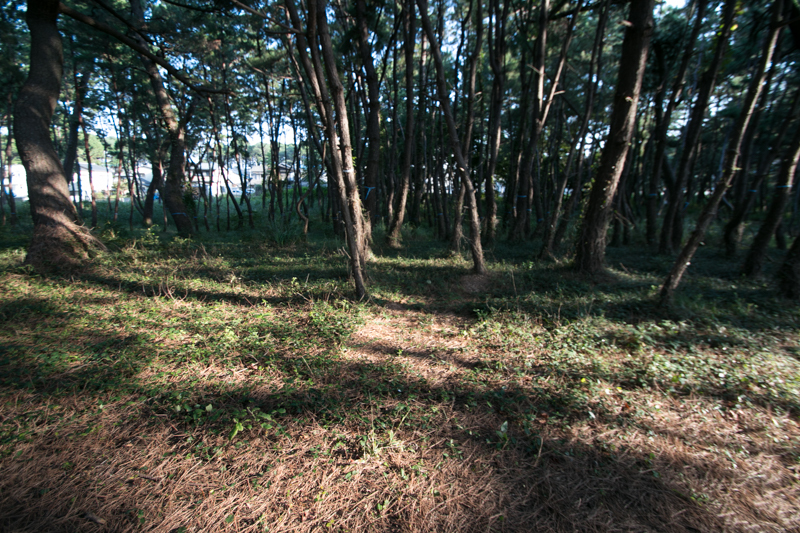 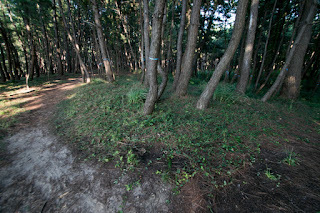 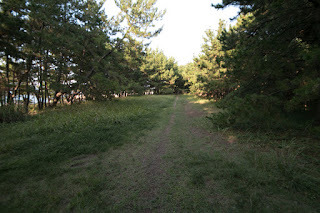 At the top of Atsukashi-yama mountain there might be a small fort to watch the line and command the army. This wall was basically a combination of three clay walls and two dry moats of 30 meter wide, built utilizing height gap of small creek. 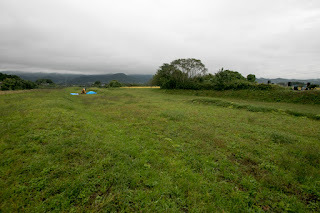 Because of development and weathering most part of clay wall was lost and remaining part became flat, but near the southern end the ruin relatively remain well. 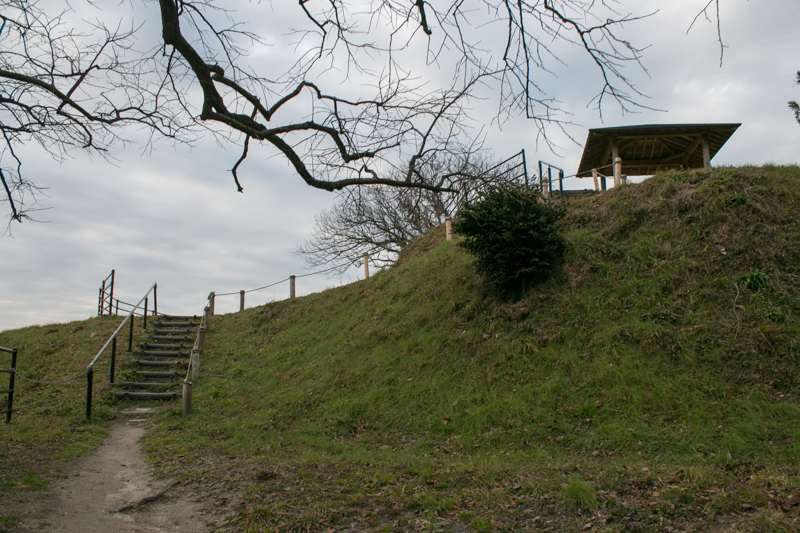 In the summer of 1589, Yoritomo Minamoto marched to Tohoku region with over 200,000 soldiers and stayed in front of the fort. 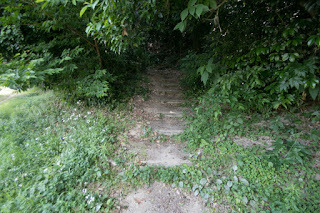 Atsukashi-yama fort stood two days before total attack of Kamakura Shogunate army, but by detour attack from the backside of Atsukashi-yama mountain guardians became confused and collapsed. 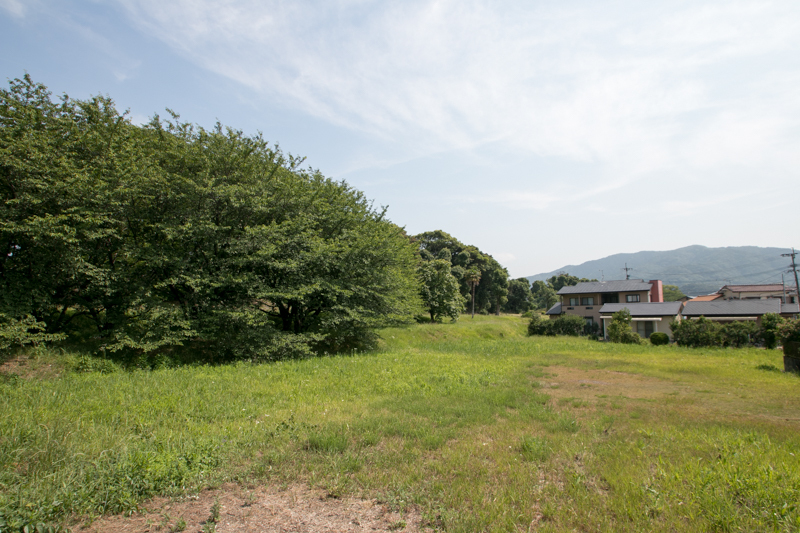 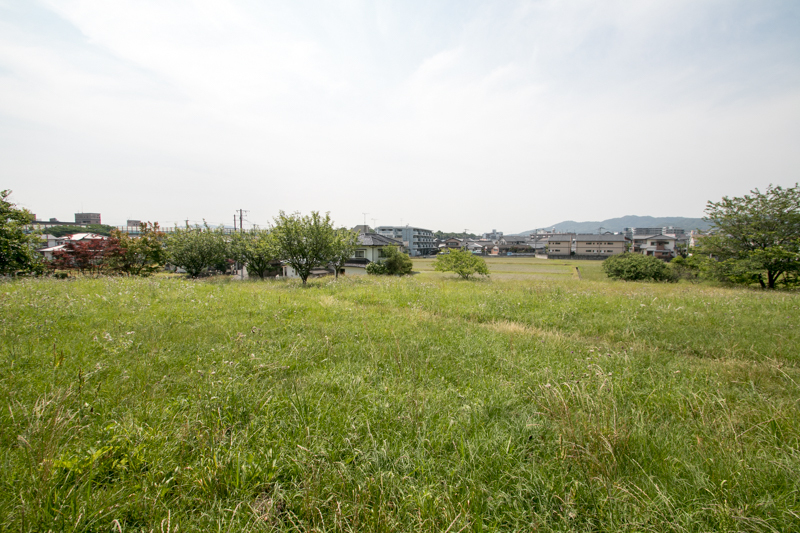 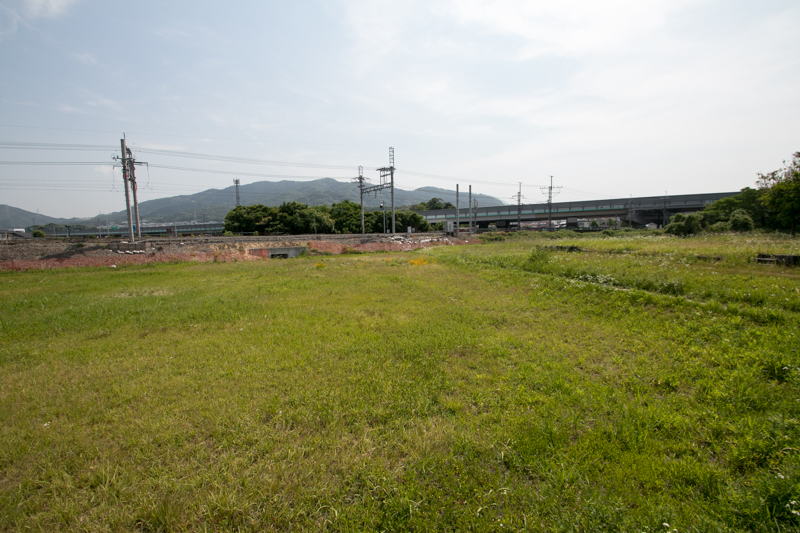 After the fall of Atsukashi-yama fort, Oshu-Fujiwara clan could not resist any more and was ruined in two week. 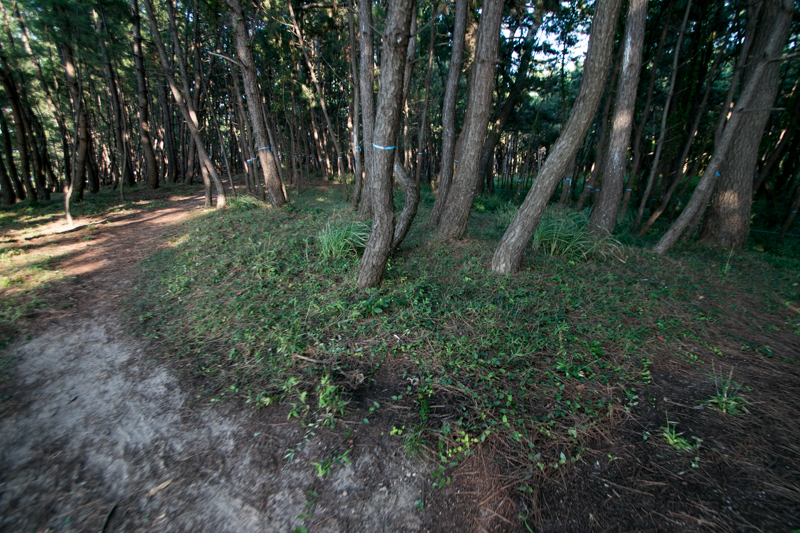 Date clan activated at this battle became the lord of this area, then later became the major power of Tohoku region in the medieval era. 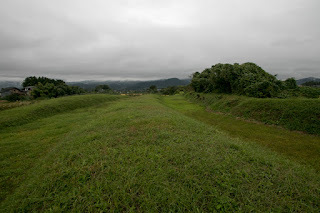 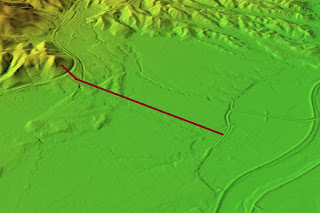 The line of clay wall was also the line divided the ancient era and medieval era of the region.